– Natural wax ingredients, skin friendly. – Provides a thin, economic and hygienic application. – Developed for all types of skin: armpit, bikini area, eyebrows, beard and other stubborn hair growth area, more suitable for small area hair removal. – For hair removal on all body parts. 2.Heat the wax to a melting temperature,after the wax melted,spread a layer (Recommended Thickness : 2mm ) of wax with a spatula on the skin along the direction of the hair growth. To have a better hair removal, please keep the melted wax temperature about 42-105℃. If the temperature of melted wax is lower than 40℃, it can NOT remove hair. 3.The first hair removal with wax may be some pain.If you have any problem about wax, please contact us for User Guide! ➤Natural Mild Ingredients – Chamomile, Lavender flavors for you to choose. Natural wax ingredients, skin friendly. 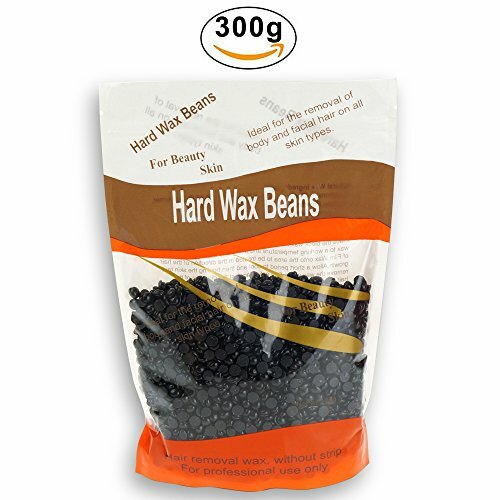 ➤Dry Fast & Won’t Break – The Hard Wax Beans dry fast, which makes it ideal for full body use. As the hard wax does not break, it allows for long and thin wax layers to be made, resulting in the use of less wax. 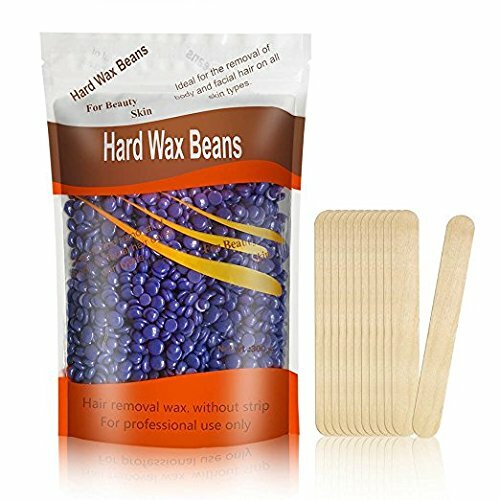 ➤Use for Any Part of Your Body – Great for body FACE,FINGERS,ARMPITS,LEG,ARM,SOME SENSITIVE AREAS,BIKINI AREA etc..
➤Easy Operation – Simply melt the wax beans in a wax warmer, then use a wax stick to apply the wax to your unwanted hairs. When the wax gets dry, tear it off from your skin directly with no cellophane or non-woven strip needed! 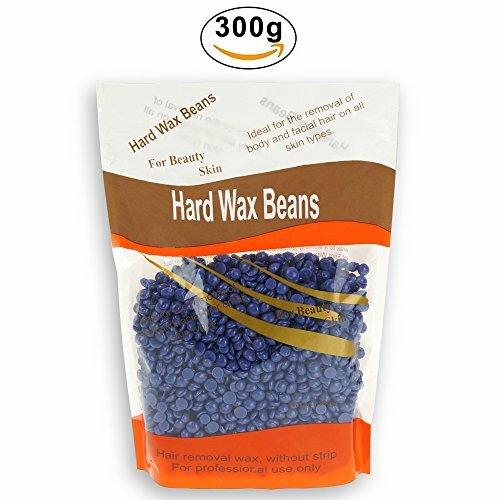 ➤Less Skin Irritation- Hard wax bean are ideal for full body; it provides a moisturizing and smoothing effect, which enables a soft and non-aggressive waxing procedure,making for a more comfortable hair removal experience. Lifestance hard wax is guaranteed by FDA and all made by natural ingredients. If for any reasons you don’t like the hard wax, feel free to write us. 60-days replacement or full refund is available. Please sent us an email before any action. You won’t have any lose purchasing it! 1. Please be sure to seal wax beans if you didn’t finish using it in one time. 1. Ensure the wax is not too hot before applying to skin. Check if the wax temperature is comfortable for spreading by applying a small dab to the inside of your wrist with a spatula. 2. When the wax is in liquid status like water. Do not apply it on skin as the temperate must be higher than 200 ?.If apply, burn can happen. 3. The best working temperature for wax is 150-170 ?,you can achieve the best hair removal effect on that temperature. 4. If any residue after waxing, please use olive or makeup oil to clean up. 1. Dot not use wax on broken or irritated skin. 2. Do not use wax if your skin suffered any adverse reactions to wax before. 3. Do not use wax within 2 hours after taking a shower or sunbathing. [WAX HAIR REMOVAL] Excellent grip on strong & stubborn hairs, ideal for bikini line, armpits, chest, legs, back & underarm. The wax beans remove 90% of your unwanted hair, you can get the remaining few hairs with tweezers (Search B071W86YQT ) to get or apply a second strip. [EASY TO USE] Use Lifestance wax warmer to heat the hard wax to a workable status. Then using a spatula to stir the wax. Wait for 2-3 minutes to cool the wax beads and then spread a layer of film wax onto the area to be treated in the direction of the hair growth and you can simply pull it off smoothly with opposite direction of hair growth, without applying strips on top. Leave the skin smooth, hair free, residue free. [NATURAL INGREDIENTS] The wax beans is guaranteed by FDA certificates. Safe to Use. The hard wax is created with Chamomile, enriched with beeswax which leave the skin smooth, hair free, residue free and revitalizes your skin. [MONEY SAVING] Now you don’t have to spend hundreds of dollars at a salon getting a Brazilian Wax! 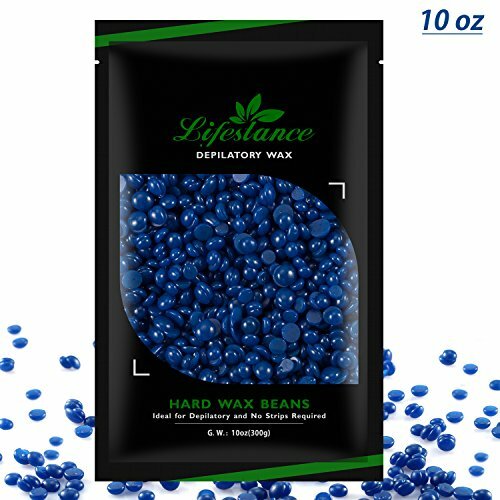 You can do it right at home with Lifestance wax beans! Hair Removal Parts: arms, legs, face, armpit, sensitive areas. Suitable for hair removal on all parts of the body. Particularly effective on the bikini area. More suitable for small area hair removal. [CAUTIOUS] Check if the wax temperature is comfortable for spreading by applying a small dab to the inside of your wrist with a spatula. Ensure it is not too hot (you may burn) nor too cold (wax won’t spread or remove hair). Ideal For Depilatory and No strips required. Can tear off the wax from your skin directly by hand after the wax is cold and becomes hard. 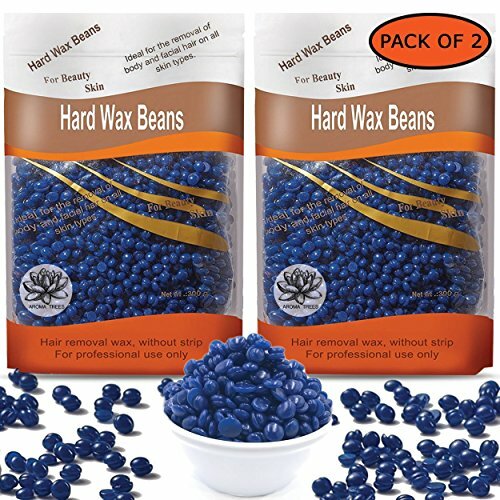 EASY TO USE: Take a wax heater pot to melt the wax beans;➤ Use a spatula to apply the wax to your hairs;➤Quick rip off the wax,don’t need strips or cloth to remove it. Natural wax ingredients.No harms to your health. Save your money and time:you can do a depolatory at home by yourself. Natural wax ingredients,Chamomile smell.No harms to your health. Can remove above 90% of the hairs you want to remove at one time,then you can use a tweezer remove the rest hairs or apply the wax a second time,that will be very easy. Small wooden applicators for waxing eyebrows, bikini areas, hair removal and other small or detailed areas. Large wooden applicators for waxing general areas. Made of durable wood material, with smooth and flat surface, will not hurt your skin. The wax applicator sticks can be applied for removing waxing eyebrows and bikini areas, or other hair, work well with wax, good product for daily use. Size: 5.9 x 3.3 x 1.5 inch. Including small parts, keep it away from children. Quantity: 100 pieces wax applicator sticks. Material: wood. Size: 5.9 x 3.3 x 1.5 inch. 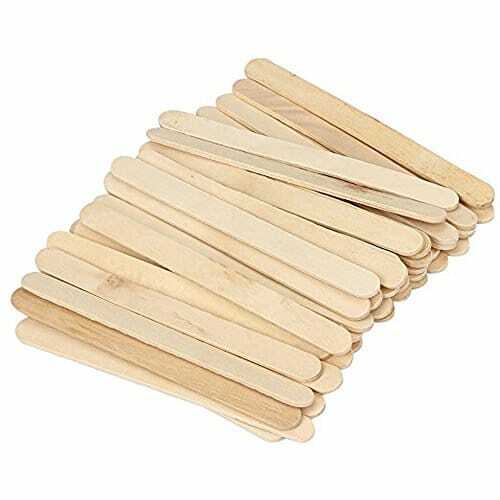 These wax applicator sticks are made of wood material, with smooth and flat surface, will not hurt your skin, useful and practical. Home or Salon Use. These strong, disposable sticks are best for waxing both at home and in professional salons and spas. Application: Facial, arms, underarms, legs, bikini area of all types skin. Excellent for strong hair removal. Provide an economical and healthy skin beauty. Apply to all types of skin: armpit, bikini area, eyebrows, beard and other stubborn hair growth area, more suitable for small area hair removal. – Clean the area you want to be treated. – Completely melted the hair removal beads in wax warmer. – Put the melted wax onto the area to be treated in the direction of hair growth. – When the wax becomes cool and hold the skin taut, tear off wax with a firm action against the direction of the hair growth. – Clean the skin with appropriate oil after wax. 1. Wax is for external use only. 2. Do not heat the hard wax in the microwave, stove or electric burner. 3. Never use the wax on abscess, sunburn or other injured skin. 4. Do not wash the wax on skin with water and alcohol, no swimming nor exposure in 24 hours of waxing. 5. Be careful. wax is flammable. Storage in refrigerator if the ambient temperature is too high. 7. If you have any problem about wax, please contact with us for User Guide! You are 30-days guaranteed. Here is a no risk purchase for Amwell’s quality products. Please sent us an email before any action. 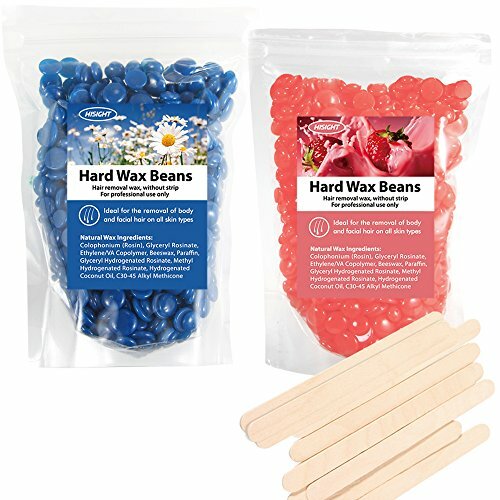 EASY OPERATION: Melt the hard wax beans to a suitable temperature by wax heater. Then use a spatula to spread the wax to your unwanted hairs. When the wax gets dry, tear it off from your skin directly. It can remove the hairs easily. NATURAL INGREDIENTS: Natural wax ingredients, skin friendly. provides a moisturizing and smoothing effect, which enables a mild and non-aggressive waxing experience. Slight aroma. BEAUTY YOUR SKIN: Ideal for the hair removal on face, arms, underarms, legs, bikini area of all types skin. Natural Ingredients: Colophonium(Rosin), Glyceryl Rosinate, Beeswax, Paraffin, Glyceryl Hydrogenate Rosinate, Hydrogenated Coconut Oil. Natural wax ingredients, skin friendly. Excellent grip on strong stubborn hairs, ideal for bikini underarm. Applicable Parts: Armpit, bikini area, eyebrows, beard and other stubborn hair growth area, more suitable for small area hair removal. 1. Take appropriate amount of wax beans into a depilatory wax heater to melt. 2. Heat the wax to a melting temperature, after the wax melts, spread a layer of wax with a spatula on the skin along the direction of the hair growth, at least 1.5mm thickness wax film, and the hairs must be longer than 5mm. 3.When the wax becomes cool, hard and holds the skin, pull the wax with a firm action against the direction of the hair growth quickly and strongly. The Faster, The Less Pain. · Ideal For Depilatory and No strips required. Can pull off the wax from your skin directly by hand after the wax is cold and becomes hard. · Natural wax ingredients. No harms to your health. · Can remove above 95% of the hairs you want to remove at one time, then you can use a tweezer remove the rest hairs or apply the wax a second time. · Easy operation,you just need more a wax heater pot,and a spatula to apply the wax to your hairs. · Save your money and time:you can do a depilatory at home by yourself. Perfect for professionals looking to make hair removal simpler than ever! The simplest hair removal wax for anyone who wants a fast-acting, reliable solution. A simple, safe solution for wax hair removal without any side-effects. Only natural ingredients are used to help make sure this is a safe, easy to use wax hair removal solution. Rapid melting ensures that these melt within ten minutes, allowing for quick application and usage. This is the ideal choice of wax for hair removal for wax warmer solutions. Pain-free solutions that avoid any kind of allergens to allow for quick and simple wax hair removal. A strong and simple wax hair removal with warmer, this allows for simpler hair removal without any of the usual pains involved. No need for hair removal paper; all you need are these warm wax beans, a wax heater pot and a spatula for simple application! A must-have Brazilian waxing skin care solution that’s made to be easy to use, apply and enjoy. High Quality Natural Wax Ingredients:The hair remove is a physical process, so it dosen’t hurt the skin,No harms to your health. Easy To Use:You There’s no need for strips,Just Need More A Wax Heater Pot,and A Spatula to Apply The Wax To Your Hairs. 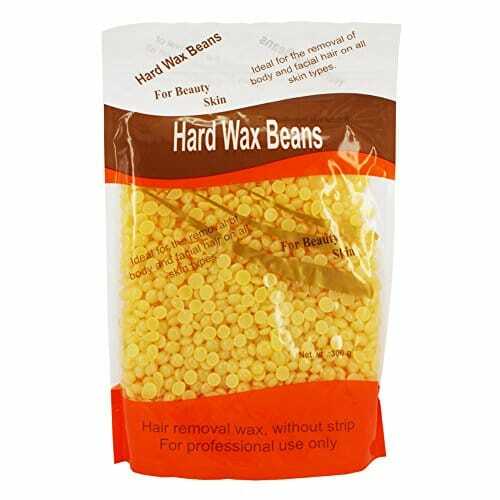 Good Effect：Hard Wax Peel off Hair Removal Wax Beans Can remove above 90% of the hairs you want to remove at one time,then you can use a tweezer remove the rest hairs or apply the wax a second time,that will be very easy. NO Hurt Painless:It Can Be Used To Remove Unwanted Hairs From Any Part of body facial arm legs and sensitive areas bikini area,Effective For Removal of Coarse and Short Hairs. 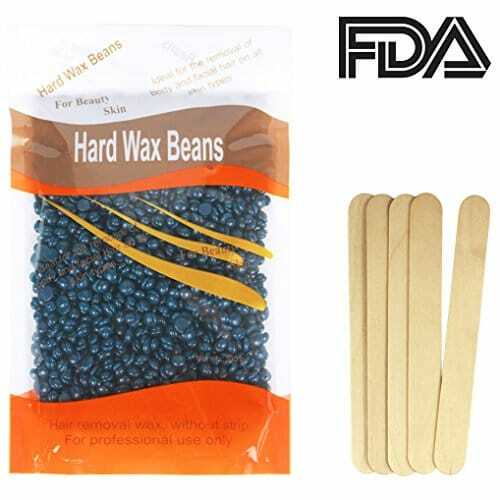 Save Your Money and Time: The package includes 200g wax beans and 10 wax applicator sticks . Soft touch of the wax makes it ideal for your delicate skin. It also dries fast, which makes it ideal for the bikini area and for use during the warmest periods of the year. As the hard wax does not break, it allows for long and thin wax layers to be made, resulting in the use of less wax. High Quality Natural Wax Ingredients: no harms to your health. The hair removel is a physical process, so it doesn’t hurt the skin. Easy operation: Simply melt the wax beans in a wax warmer, it can also be melted in a cup in the microwave, then use a spatula to apply the wax to your unwanted hairs. When the wax gets dry, tear it off from your skin directly with no cellophane or non-woven strip needed! Good Effect: Can remove above 90% of the hairs you want to remove at one time,then you can use a tweezer to remove the rest hairs or apply the wax a second time,that will be very easy. Great for body facial arm legs and sensitive areas bikini area hair remove wax beans, effective for removal of coarse and short hairs.